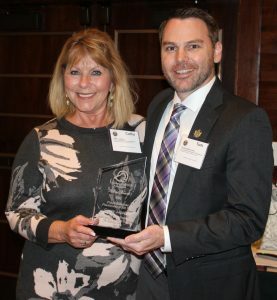 Tom Matuschka, NRMC Vice President of Business Development and Philanthropy presents Cathy Jacobs, Director of Physician and Community Relations, with the Louisiana Hospital Association’s Public Relations and Marketing Group’s Golden Pelican Award for Public Relations Practitioner of the Year at the annual LHA meeting. Recently, the Louisiana Hospital Association’s Public Relations and Marketing Group held its annual Pelican Awards Luncheon. We are pleased to announce that Natchitoches Regional Medical Center’s Cathy Jacobs received the 2018 Golden Pelican Award for Public Relations Practitioner of the Year! The hospital received three additional Pelican awards for excellence for advertising and marketing initiatives at the annual Louisiana Hospital Association meeting.